There is a photo of me at age six, sitting at the kitchen table with my fingers and face covered in chocolate brownie batter. I am also wearing blue fuzzy earmuffs, simply because I liked them. Or maybe I was wearing them so I wouldn’t be able to hear my father telling me to stop eating raw batter. Of course, this raw batter was created from a boxed mix, full of sugars and magical ingredients. After adding a tube of Hershey liquid chocolate and some eggs, brownies appeared. 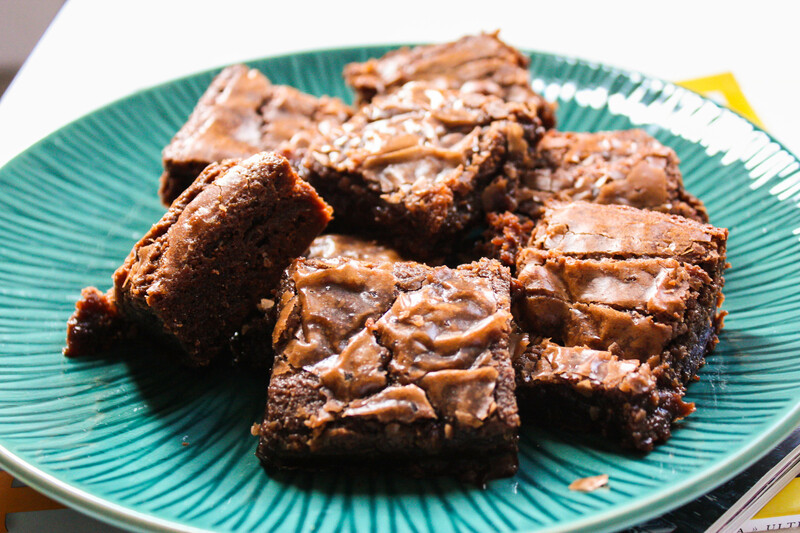 These Chocolate Hazelnut Brownies with Sea Salt are not from a box. But, for some reason, the Nutella flavor is subtle enough that these treats could be discerned as from-the-box. 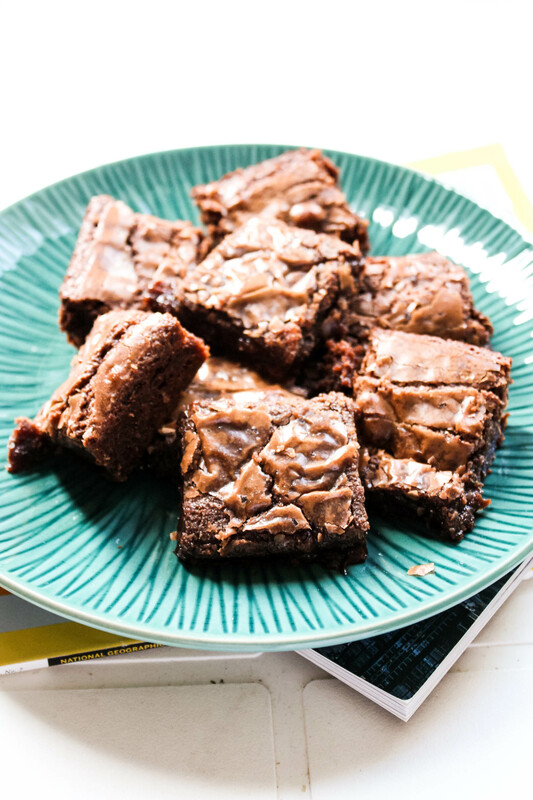 The crackly crust, with a gooey interior is what makes these brownies so addictive. This is lick-the-bowl worthy batter, with a finished product guaranteed to please. Preheat oven to 350 degrees. In a small bowl, mix flour and salt. Separately, mix butter with sugar, eggs, and vanilla. Stir in Nutella until well mixed. Stir in flour and salt mixture. 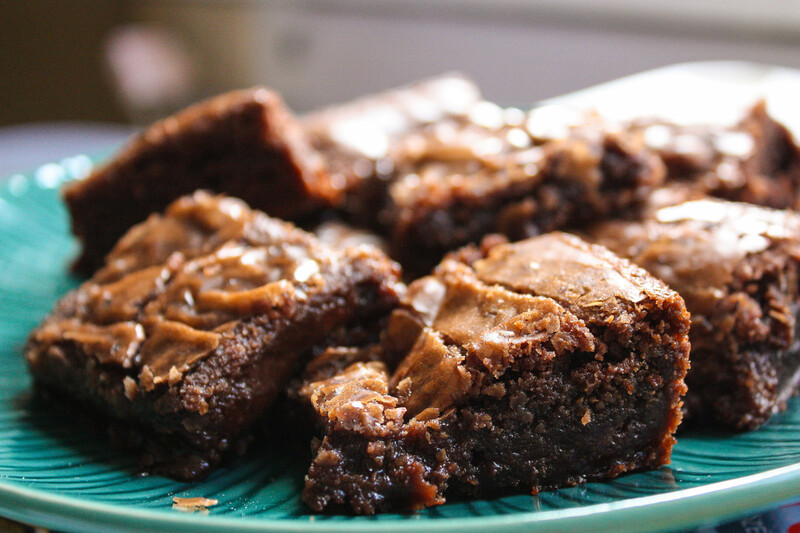 Pour batter into a greased 8″x8″ pan. Sprinkle sea salt on top of batter. Bake for 33-36 minutes. Cool pan before cutting into squares. Oh WOW! These look great [and taste amazing, I’m sure].